Google Analytics is a free web analytics tool from Google that tracks and reports website traffic. Knowing this information will help you refine your marketing strategies or improve the design of your website so that you can increase your conversions. Do you want to learn how to install Google Analytics in your web in an easy way? If the answer is yes then please continue to read. What kind of information does Google Analytics provide? Google Analytics gives you lots of interesting information on your online marketing strategy and divides it into 4 categories. Audience: This category gives you information about people who visit your website. How many users, how many pages do they visit, average visit length, bounce rate (people leaving your web in less than x minutes) … Also collects demographic data about your audience such as gender, age, country, Language, which browser they use, from which device they connect and even their interests. Very interesting information that will help you build a strategy on how to get and keep more visitors on your site. Acquisition: Here you can see where visitors to your website come from, if it comes from organic results (comes from searches on Google), direct (people looking for your website directly), Social (through social media) or Email (via a link in an email). You can also see who referred them to your website. Behavior: You can find information about how visitors behave when entering your website. What are the main landing pages, what is the flow of the user (to which other pages they navigate), what page they leave from, etc. Conversions: In this section you can see your objectives which are considered conversions. If your goal is to get emails, you can create a conversion for every time someone signs up for you email list on your website. If you have an online store, a sale would also be a conversion. A conversion is any action that you find interesting within your website. Knowing all this information helps us to know what is working or what is failing on our website and then we will be able to correct errors and guide our focus our efforts where they are needed most. 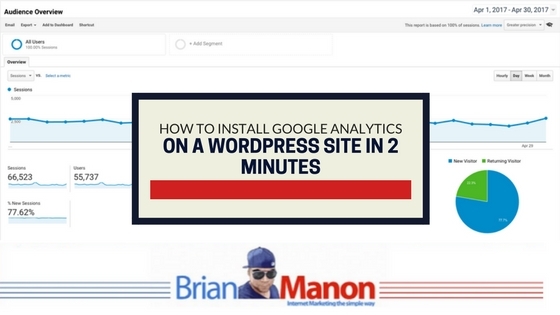 What is the easiest way to install Google Analytics WordPress? You can install Analytics by manually entering the tracking code on all the pages on your website that you want to be analyzed. This method requires ftp connection and for you to edit the files on your website. It is longer, complicated and risky. But the easiest way is to use one of the many WordPress plugins for Google Analytics. Also many SEO plugins allow you to connect your website with Google analytics, because they have a section to enter the tracking code of your account. I personally like the plugin Google Analyticator , because it allows you to have a graphical summary on your desktop where you can view all of the visits from the last 30 days, the most visited pages, referrers and top searches. You can also install it in less than 2 minutes! Go to Google Analytics . (You need to have a free Gmail account so you can have access to analytics). Sign in with your Gmail account, if you do not have one, you will have to create one. Once you are signed in you will have a choice between website and mobile app select ‘website’. Fill in the details account name, website name, website url, website category and time zone. You do not need to change anything else from the rest of the configuration. It will open a screen in which you have to accept the conditions of service. Accept the conditions. Create your free account on Google Analytics . Go to plugins / add new and search the plugin Google Analyticator in the library of WordPress plugins. Install the Google Analyticator plugin and activate it. In the sidebar of the wordpress dashboard, you will see that at the bottom there is a new tab called Google Analytics. There you can connect your website with your Google Analytics account to start analyzing visits to your website. You will have to wait a few hours until you start getting data to appear on your account. I still haven’t mastered this, but I wouldn’t make as much progress without knowing what content is performing well. Brian I always love how all your information is so thorough and plainly spoken that even someone as NOT tech savvy as myself can manage myself in the awesome world of blogging! Very well and in-depth post on analytics! Thank you! I love Google Analytics. Who knew it was so easy to put on my WordPress?